Poll Results: Best Vampire or werewolf Acting? Best Vampire or werewolf Acting? 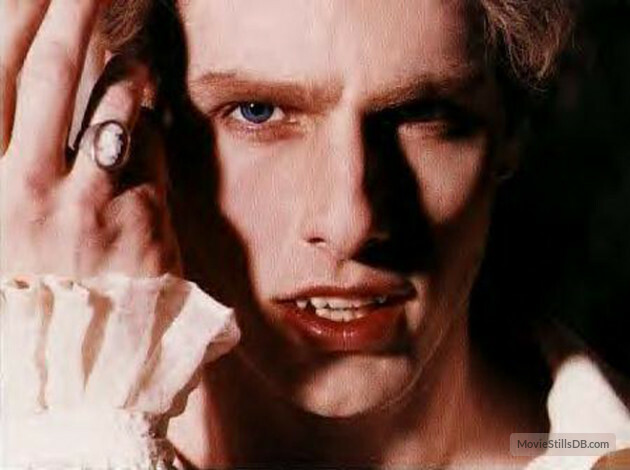 In first place we have Tom Cruise as Lestat de Lioncourt in Interview with the Vampire. In second place, we have Salma Hayak as Santanico Pandamonium in From Dusk till Dawn. Tying for third place, we have Jack Nicholson as Will Randall in Wolf and Christopher Lee as Count Dracula in various Hammer movies. Tom Cruise and all the other vampire actors were required to hang upside down for up to thirty minutes at a time during the make-up application. Johnny Depp was offered the role of Lestat. There’s a scene towards the end of the movie where Louis is watching Superman (1978) in a cinema. This scene doesn’t appear in the novel because the book was written in 1976, two years before the film was made. Salma Hayek did not have a choreographer for her dance. Director Robert Rodriguez just told her to feel the music and dance to it. Rodriguez would later use the same tactic with Jessica Alba in Sin City (2005). If you look closely, when Cheech Marin is playing the Customs Agent, his name badge says, “Oscar Marin” which is Cheech’s real-life father’s name. His father was an LAPD officer. Although the film is about a werewolf, that particular word is never mentioned. Christopher Lee’s last film for Hammer as Dracula, The Satanic Rights of Dracula was the final Hammer film in which both Christopher Lee and Peter Cushing appear. Watch out for another poll soon, this time on scifi movies! Vote: Best Vampire or Werewolf Acting?